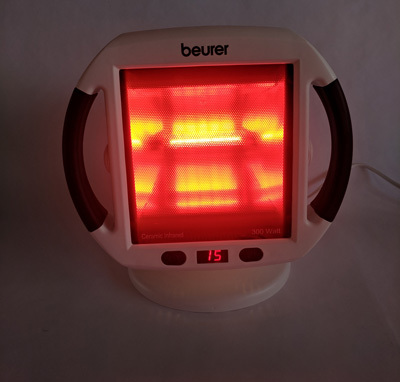 The Beurer IL50 heat lamp is an infrared lamp that is used for the temporary relief of muscle pain, joint pain and stiffness, and the temporary increase of blood circulation. The device can also be used to treat colds and bronchial congestion by reducing inflammation, which helps to clear clogged passages. It treats a large area of the body at once, and for only $72.58, the lamp is much more affordable than similar products on the market today. INFRARED HEAT LAMP: Designed to deliver infrared heat to the body. The infrared heat improves the blood flow and circulation of the target area, encouraging muscles and damaged tissue to heel. 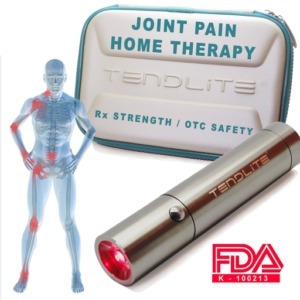 DRUG FREE & NONINVASIVE PAIN RELIEF: Targeted for use on the entire body. 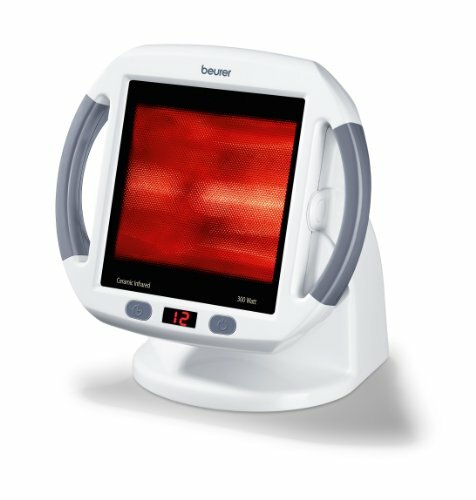 Treatment area is 11.8″ x 15.7″ – ideal for larger parts of the body, keep at a minimum distance of 12″-16″. PORTABLE AND CONVENIENT: Easily adjustable to direct heat where you need it, and portable with a cord winder. 300W bulb behind ceramic glass delivers even, consistent infrared heat to the target area. 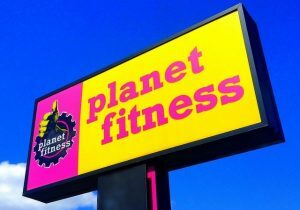 IMPROVES CIRCULATION: Warmth opens up capillaries, improves circulation & aids to get rid of toxins inside your body, encouraging joints, muscles & damaged tissue to heal – while reducing stiffness. 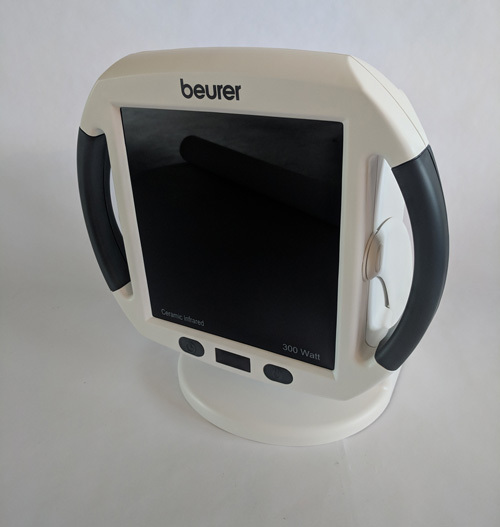 Beurer, a company that originated in Germany, launched it’s U.S. Subsidiary in 2010. Currently, Beurer has 33 products in it’s North American market, and a total of 400 products in its European market. More information about the company, including their contact information, address, and product lists can be found at www.beurer.com. The heat lamp has a sturdy, long-lasting look and design. 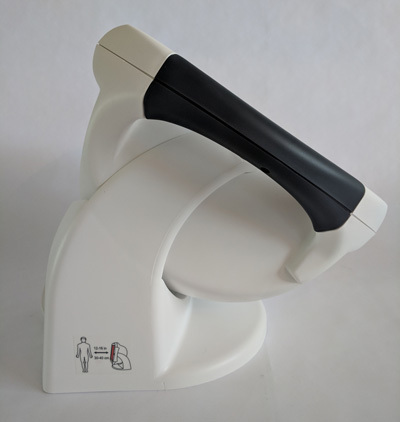 It is equipped with a high-quality ceramic plate with a tilting function, two control buttons, and one handle on either side of the plate for better manoeuvrability. It really feels professionally made and unlike a lot of it competitors we cpuld not find a fault with the build quality. From the high qulity plastic to the study tilting stand, everything about this product screams high quality. The Packaging is sturdy cardboard. 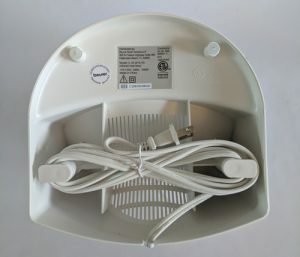 To use the device, simply remove it from the packaging, and plug it into a wall outlet and set your preferred treatment time using the control buttons. Set the lamp on a sturdy, hard surface such as a dresser, table, or chair, and sit 12-16 inches from it, with the treatment area facing the device. Use the tilting feature to angle the lamp towards the area of pain, if necessary. Once the treatment is complete, let the device cool down before attempting to move it or perform another treatment. The device produces 300 watts of power and works in most standard 110v outlets. The wavelength of the light has not been exactly determined although it covers a broad red spectrum. The light produced starts at 500 nm and ranges to 2500 nm. The peak is primarily around1250nm. 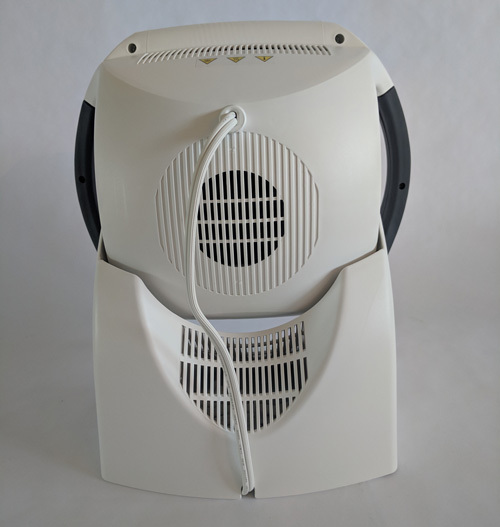 User reviews have shown that the lamp has successfully treated sore and achy backs and bronchial congestion in consumers who suffer from frequent sinus infections. 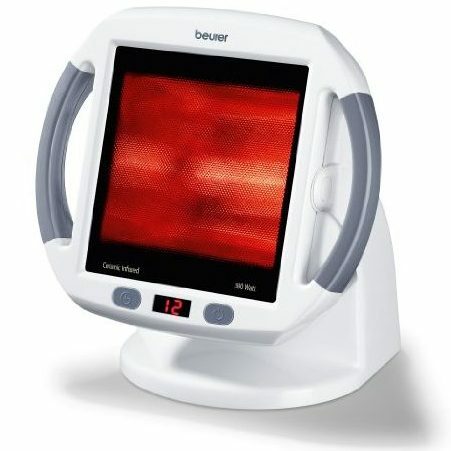 The user should take caution when utilizing the device to treat pain or sinus infection in the facial area, as the light could potentially irritate your eyes until you are accustomed to the light. 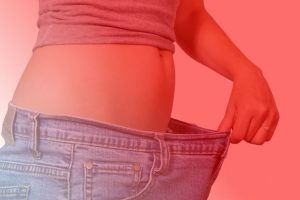 In spite of this, the lamp is proven to be both safe and effective for all other areas of the body and produces noticeable pain relief after the first use. 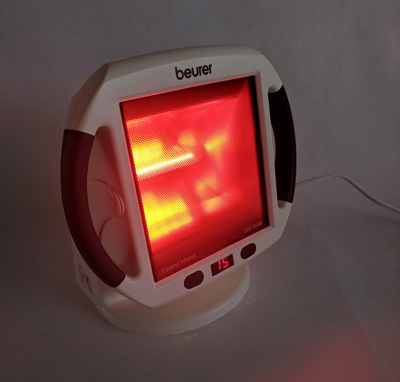 The Beurer heat lamp gives the user to ability to set the treatment times, between 1 and 15 minutes long. It also has an auto on/off timer, which doubles as a safety feature in the event that the user walks away and forgets to manually shut off the machine. The ceramic plate is also equipped with a tilting feature, making it easier to treat those hard to reach places. When not in use the cable can be stored away in the base of the unti which is a nice feature. 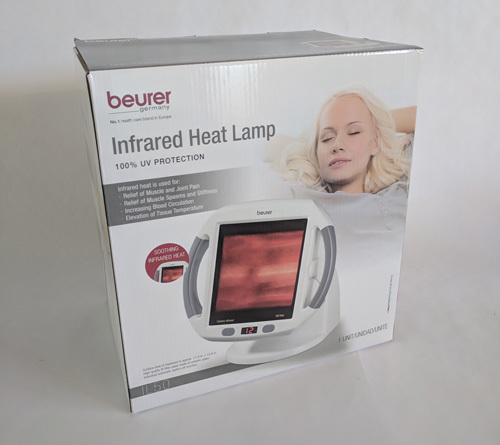 The Beurer IL50 Infrared Heat Lamp sells for $72.58 on Amazon. 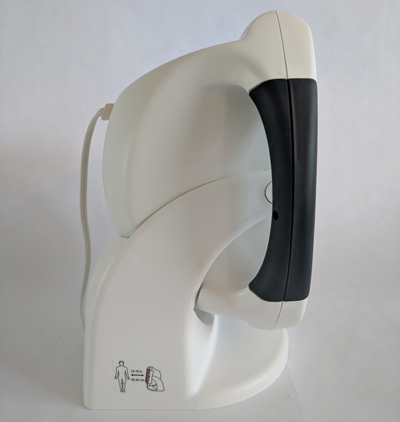 This is a fair price for the pain relieving benefits the user receives, and to add to the relatively low cost, the company also offers a limited lifetime warranty. All in all, this is the best infrared heat lamp on the market. It packs a punch and although not portable is perfectly sized to sit on a side table or a nightstand. The build quality is excellent and the price is fantastic. This easily earns our Editors award for the best Infrared Heat Lamp on the market today.